US PRESIDENTS must really curse their predecessor Franklin Roosevelt. The Depression-era leader passed 15 major pieces of legislation within 100 days and established a high watermark of action against which every president since has been judged. Donald Trump reaches his 100th day in office on Saturday, which gives Washington watchers a chance to stop and assess how successful a president he has been and what sort of leader he's shaping up as. Mr Trump been dancing an intriguing twostep the weeks leading up to the milestone. On one foot, he has dismissed the marker as "ridiculous", and said that regardless of his successes, the media will "kill" him. House receptions and a huge rally in Pennsylvania to mark the milestone. The New York Times summed up his contradictory approach with this headline: "Trump Wants It Known: Grading 100 Days Is 'Ridiculous' (but His Were the Best)". Mr Trump is likely to cop some harsh appraisals this weekend, especially considering that he explicitly promised to achieve a great deal within his first 100 days in office. 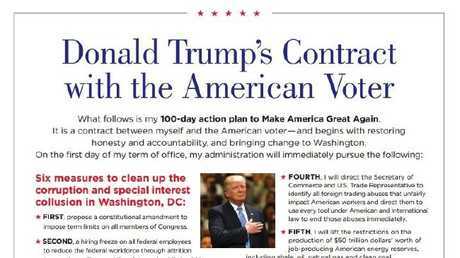 The most public way he did this was via his "Contract with the American Voter", a two-page document released in October bearing Mr Trump's signature, described as his "100-day action plan to Make America Great Again". The document is hugely ambitious and, if you look at the contract in isolation, Mr Trump has summarily failed to meet his promises to the American people. He has taken some action on the executive orders he proposed, but even a favourable reading of the document would, at best, give him a mark of one out of 10. On the second page of the contract, Mr Trump outlines 10 legislative goals he promises to introduce and pass through the Congress with the first 100 days. To date, he has barely followed through on one of them - to repeal and replace Obamacare. His first draft at a new healthcare bill was pulled before it was even introduced because it was clear it didn't have enough votes. And a new version is now being debated among Republicans before being introduced to the House of Representatives. It's not exactly what you would call "winning bigly". Mr Trump revealed a tax-cut blueprint on Wednesday in an attempt get a tick in his column before the 100-day mark. 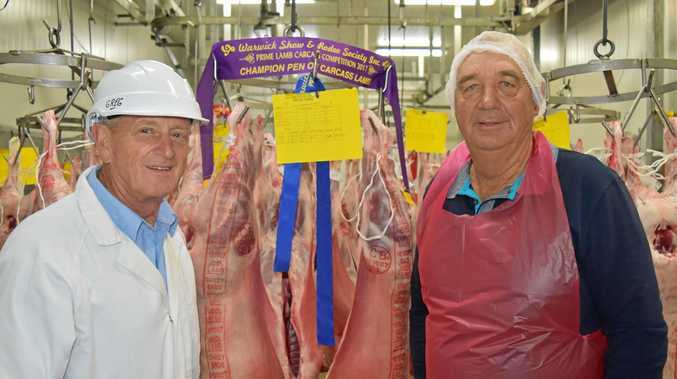 Although light on detail, the plan is to reduce the business tax rate from 35 per cent to 15 per cent, double the tax-free threshold for couples to $24,000 and simplify the process for filing tax returns. Regardless, Mr Trump's plan is still only a blueprint and is yet to go before the Congress. In the October 'contract', Mr Trump proposes the "End the Offshoring Act", which would establish tariffs to discourage companies from retrenching US workers and sending jobs offshore. Mr Trump's rhetoric has been helpful in encouraging a number of companies to keep factories open in the US, including Indiana furnace-manufacturer Carrier, which stopped 700 US jobs from going to Mexico after lobbying from Mr Trump. However, the President has not proposed or passed any legislation on the policy. Mr Trump promised to invest $US1 trillion in infrastructure over 10 years via public-private partnerships and tax incentives. The program was not mentioned as part of Mr Trump's tax plan on Wednesday. The action plan proposed to shake up education funding so parents could send their kids to the school of their choice. No laws to this effect have been passed, but Mr Trump signed an executive order on Wednesday designed to empower local communities and stop federal intrusion into school decision-making. One of the President's key election policies was to repeal and replace Barack Obama's healthcare program. Republicans introduced a plan to Congress to do just that, but in March it was pulled before facing a vote, as it looked likely to be defeated, most notably by members of Mr Trump's own party. While this was an embarrassment for the President, the plan is not dead. Signs are favourable that Republicans will be able to pass a new Bill, which Mr Trump said last week had "gotten really, really good". Mr Trump vowed to allow Americans to deduct childcare and aged care from their taxes to make it more affordable. The policy was not part of Mr Trump's tax plan on Wednesday. Mr Trump proposed to fully fund the construction of a wall on the US-Mexican border to end illegal immigration. He said Mexico would fully reimburse the US for the cost. While the President has discussed the plan repeatedly over the 100 days, Mr Trump backed off on his demand that the wall be funded this week as the Congress negotiated a deal to avoid a government shutdown. He maintains, however, that the wall will be built within his first term. However, Mr Trump's promised "End Illegal Immigration Act", which would jail illegal immigrants for two years and ensure jobs are offered to Americans first, has not been legislated. Mr Trump's Restoring Community Safety Act - aimed at reducing violent crime and drugs - has not been introduced to Congress. Mr Trump wants to "rebuild" the US military via a significant boost in investment. While his "Restoring National Security Act" has not been legislated, he is likely to receive extra funding for the military as part of congressional negotiations this week to avoid a government shutdown. Mr Trump proposed ethics reforms to rein in the influence of special interest groups under a "Clean Up Corruption in Washington Act", but the plan has not been put before the Congress. • Supreme Court appointment: The President managed to get his choice of Supreme Court justice, Neil Gorsuch, approved. This is a is a major achievement and will help shape the legal system for years to come. • Signed more Bills into law than any president since Harry Truman: He has signed 28 pieces of legislation, according to the White House, many undoing Obama policies. He has also signed 27 executive orders, more than any president in recent memory, however, these are largely symbolic outlines of the President's intentions, rather than concrete laws. His most significant executive orders were to unwind Mr Obama's climate change policies and to approve the Keystone XL Pipeline, which will create tens of thousands of American jobs. • Decisive military action: Mr Trump sent a strong message to the world when he launched an air strike on a base in Syria in retaliation for the country using chemical weapons against its own people. He followed this up by dropping the "mother of all bombs" on an Islamic State tunnel complex in Afghanistan. • Slowed illegal immigration: Mr Trump's tough talk on immigration at the US-Mexico border appears to have affected the behaviour of would-be illegal arrivals. US Customs and Border Protection reports that apprehensions on the border were down 61 per cent since the President took office. Mr Trump has also ordered that 15,000 new immigration, customs and border patrol officers be hired. • Cut red tape: The President has signed 13 congressional review acts to clear "unnecessary regulations". 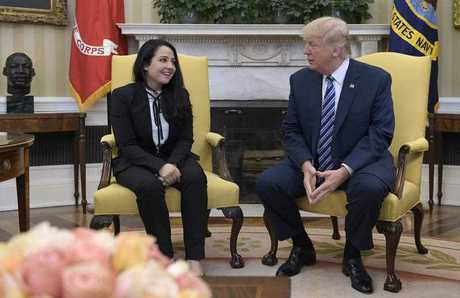 • Freed American aid worker: The administration managed to free Egyptian-American aid worker Aya Hijazi after more than three years in an Egyptian jail on beat-up charges of human trafficking and child abuse. • Boosted stock market: Mr Trump's pro-business stance and corporate tax cut proposals have had effect on the markets, with stocks up 5 per cent since he took office. • Dumped the Trans-Pacific Partnership: While binning the multinational trade deal was bad for Australia, many Americans have praised the move. "When you look at the number of pieces of legislation and the executive orders, business confidence, the US's role in the global world, there's a lot … of accomplishments that have occurred and we feel very good about what we've done as we head up to this first 100 days," White House spokesman Sean Spicer said. Ultimately, it will be up to the American people to judge whether Mr Trump has been successful thus far. For what it's worth, the polls, which Mr Trump has dismissed as "fake news", show he has the lowest support of any modern president.